Served on its own, this will easily serve 4-5. Served as a component of the meal, it’ll stretch fo 5-6 servings. Next, add onion and cook an additional 4-5 minutes to soften slightly. It will begin to turn translucent. Add ginger and garlic and cook 1 minute more. Drizzle with tamari and rice vinegar. Gently stir to coat. Cook 2-3 minutes or until cabbage starts to wilt a bit. Add remaining coleslaw mix and stir to coat. Cook 2-3 minutes until the cabbage is starting to soften. Stir in sesame oil and green onions and serve. CAN’T FIND COLESLAW MIX? No problem! Use 5 cups shredded green cabbage, 1 c shredded purple cabbage, and 1/2 cup additional shredded carrot. 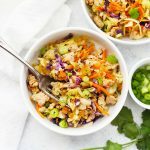 PALEO & WHOLE30 NOTES – This egg roll bowl can easily be paleo & Whole30 compliant by using a few simple swaps. First, use coconut aminos in place of the gluten free tamari. Second, use apple cider vinegar in place of the rice vinegar. Easy-peasy!